Which are the best Free Tours to do in Lisbon? A free tour in Lisbon is the smartest way to explore the city and learn all about the history, heritage, culture, and life lived here from a proper local Lisbon city guide. 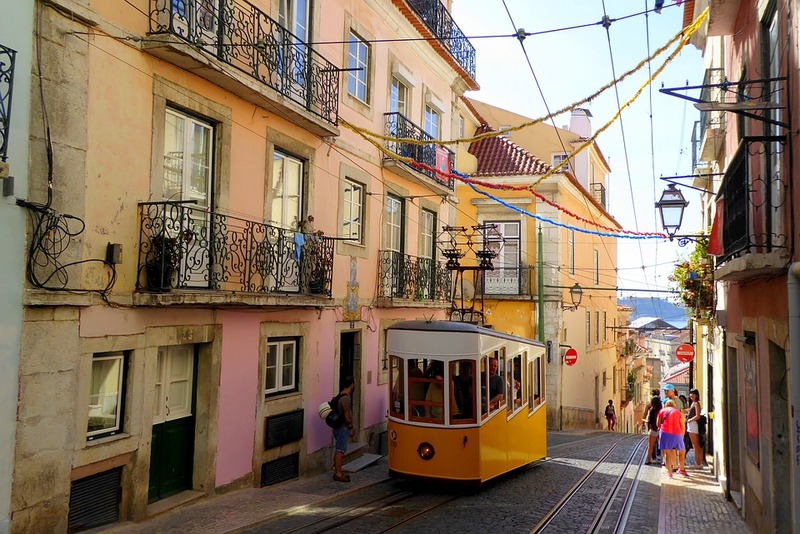 But there are as many companies offering free walking tours in Lisbon as there are hills – so which one should you choose? No matter how long you’ve got in the capital of Portugal, it’s too short; there’s so much to see & do in Lisbon that there really isn’t a minute to squander. There’s few feelings worse while travelling than regretting your choice of tour, especially when it’s too late to find an alternative or haven’t got enough time to seek out a better option. To make sure this doesn’t happen with your choice of free walking tour in Lisbon, we’ve made your quest easier by breaking down the best free tours in the capital so you can choose the one that’s right for you. You’re welcome! 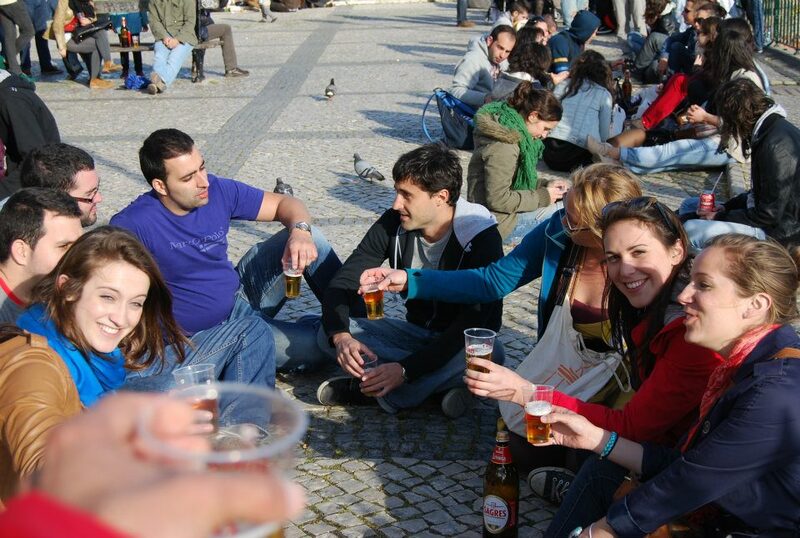 The guys & gals behind Chill Out Lisbon Free Walking Tour are the heart & soul of their free tour. Lisbon, it’s history, culture, and all it possesses, can be presented and understood in many different ways, but what makes these guides stand out from the crowd as great free tour providers is how they make it all so accessible to you, with unbridled passion for their city; and it is their city, all guides on this team are born and raised in Lisbon – not something that is a necessity for a great tour, but it’s a rare enough occurrence in big cities that it does make for an especially authentic local insight. And while many multi-destination free tour companies operate a model in which they earn commission for certain recommendations & promoting partners on tours, Chill Out Lisbon pointedly do not – keeping the ‘chill out’ element in their name very much a central ideology to their tour style; real, laid-back yet passionate, and authentically local without trying to upsell anything. They meet at Luís de Camões Square (Praça Luís de Camões) every day at 10:00 a.m. & 3:00 p.m. Oct. 1st – Mar. 31st and 10:00 a.m. & 4:30 p.m. Apr. 1st – Sep. 30th , and their 10:00 a.m. tours are also available in Spanish. They won’t be holding an umbrella as many free tour companies do, but you’ll know them by their bag featuring the yellow logo with a depiction of the beautiful traditional Lisbon tram. You don’t need a reservation, just show up and enjoy! The great thing about Discover Lisbon is they offer a choice of free tours by topic so you can really make the most of your time if you have an intrigue or interest in a specific aspect of Lisbon’s vast history or particular area, rather than just opting for a ‘general overview’ free tour. 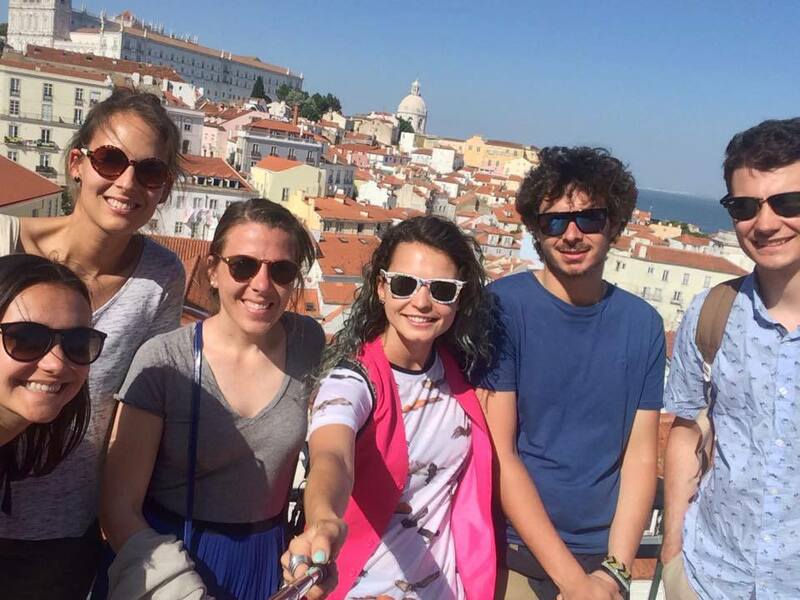 Discover Lisbon run four free tours; Alfama Tour, Mouraria Tour, Bairro Alto-Chiado Tour, and Downtown Tour. The Alfama free tour explores the traditional neighbourhood of Alfama, a delightful part of the city that exudes a warmth & charming village-feel and, as one of few districts to have survived the great earthquake of 1755, gives you a real sense of old Lisbon. It runs every day at 10:15 a.m., 10:30 a.m., and 11:00 a.m. The Mouraria free tour is a perfect insight to Fado, the incredible melancholic folk music & song of Portugal which came from this ancient Arab settlement district. It also runs every day at 10:15 a.m., 10:30 a.m., and 11:00 a.m. 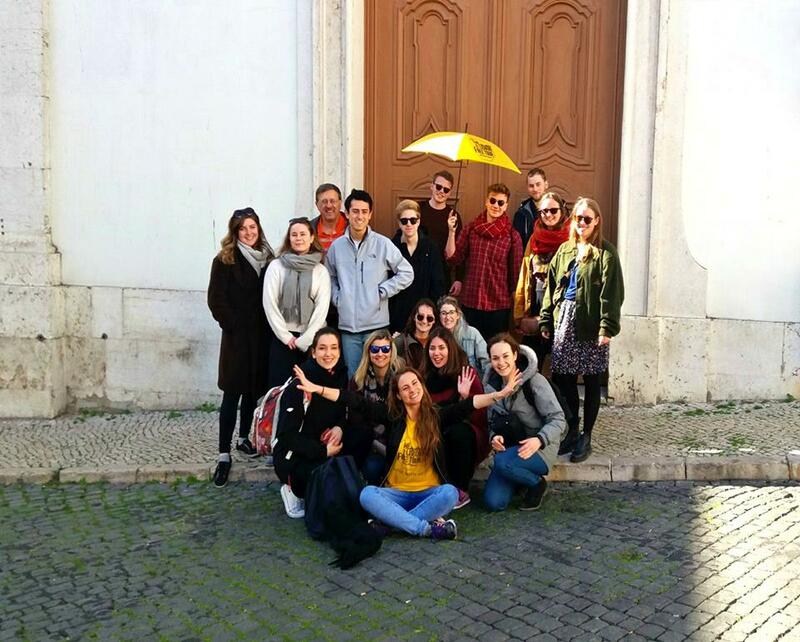 The Bairro Alto-Chiado free tour takes you through the rich history of what is now a vibrant and cosmopolitan neighbourhood. Rebuilt after the 1755 earthquake, and again after a fire in 1988, it is today a cultural hotspot of Lisbon. This tour runs every day at 3:00 p.m., so you could actually do it after one of their morning tours too, if your feet are able for it! And, last but by no means least, the free tour of Downtown blends both Mouraria and Alfama, combining key elements from both of those free tours into a perfect way to explore the best of the two districts. 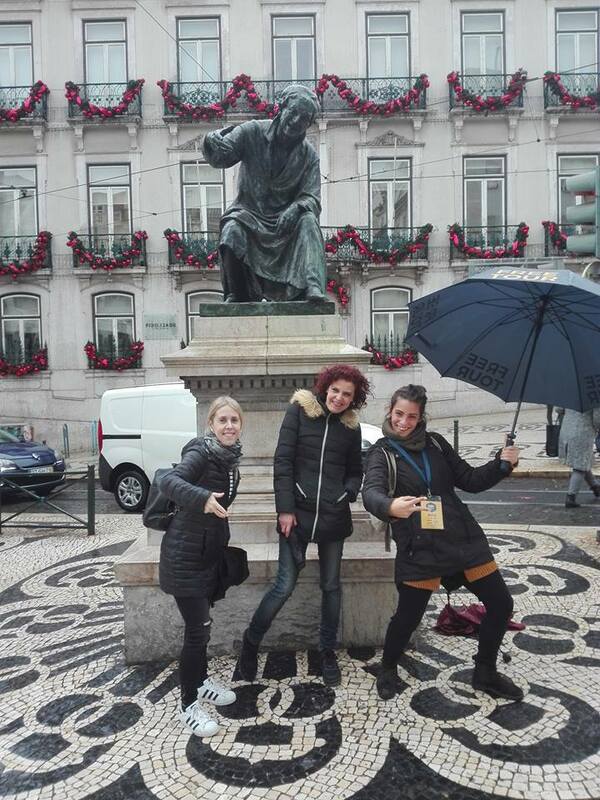 It runs every day at 10:15 a.m. and 10:30 a.m.
All tours start from Rossio Square, and you’ll find the guides in yellow t-shirts under the statue of Dom Pedro IV – that’s the huge pillar, you can’t miss it. They also offer a free tour in Spanish at 11:00 a.m. each day. Not to be confused with Discover Lisbon above, Discover Walks operate free and paid tours in ten cities in Europe, including Lisbon. Here in the Portuguese capital they offer two free tours, of Alfama and Belém. Tours of Alfama are part of every free tour company’s offering in Lisbon, but companies providing tours of Belém only offer fixed price options – except in the case of Discover walks who offer a free walking tour of Belém every day at 11 a.m. from the statue in the centre of Jardim Afonso de Albuquerque parc, the closest stop on the Lisbon subway map is Belem and it is just a few minutes’ walk from there. This tour is perfect if you want to find the best of the famous Belém pastries, and marvel at some of Lisbon’s must see sights, such as Jerónimo’s Monastery, Belem Palace and the Tower of Belem, while learning the stories behind them from a local guide. This tour also harks back over six centuries to the fascinating time when Portugal was at the fore of navigation and the discovery of the new world. The free tour of Belem takes about 1.5 hours and ends near the Monument of Discoveries. 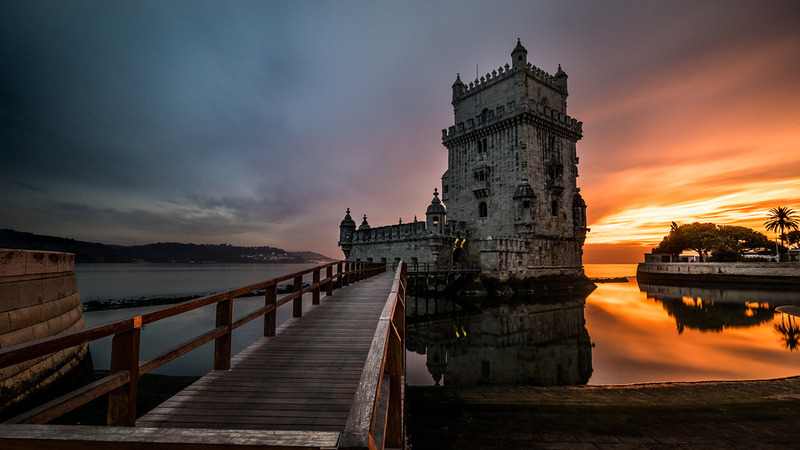 There is another tour company, Take Lisboa, who also offer free tours of Belém on Thursdays & Sundays at 10:00 a.m. in English, and on Fridays & Saturdays at 10:00 a.m. in Spanish. You can find the guides holding Blue umbrellas at Largo Chiado before the scheduled tour start-time. Do I need to book a free tour in Lisbon? Usually you can just rock up and join a free tour without a booking but during the busy summer season especially, booking is definitely advisable. Many free tour companies will have a maximum limit of people they will take in a group (usually around 20) to ensure quality and control, and while they may have one or more extra guides on standby ready to facilitate more groups, generally those of you with reservations will be prioritised over those who do not, so it can happen that you won’t get a tour, but it’s an extremely rare occurrence. You can book most free tours directly on the tour provider’s website and there shouldn’t be any booking fees or charges. Often, they might require card details to process the booking but the card isn’t charged. Just check their policies though in case they have a cancellation policy or ‘no-show’ fee that might result in charges if you cancel too late or don’t show up. A great resource for checking out the many free tour and budget tour options in Lisbon, and around the whole world, is FreeTour.com and the FreeTour app. As you most likely know by now, free tours work on an optional payment amount, or ‘tip’, basis whereby you decide how much the tour was worth to you at the end, and donate accordingly to the free tour guide. It’s a great concept, and perfect for getting excellent quality tours & local guides while staying in budget on your travels. Free tours are certainly not lesser quality tours than fixed priced options, they’re just a relatively new way to do tours. The guides work hard to earn whatever you will give them and the risk of being ripped-off is with them rather than you – so be genuine and value the tour in relation to what a paid tour equivalent would cost you, how enjoyable the experience was, and if your expectations were met. 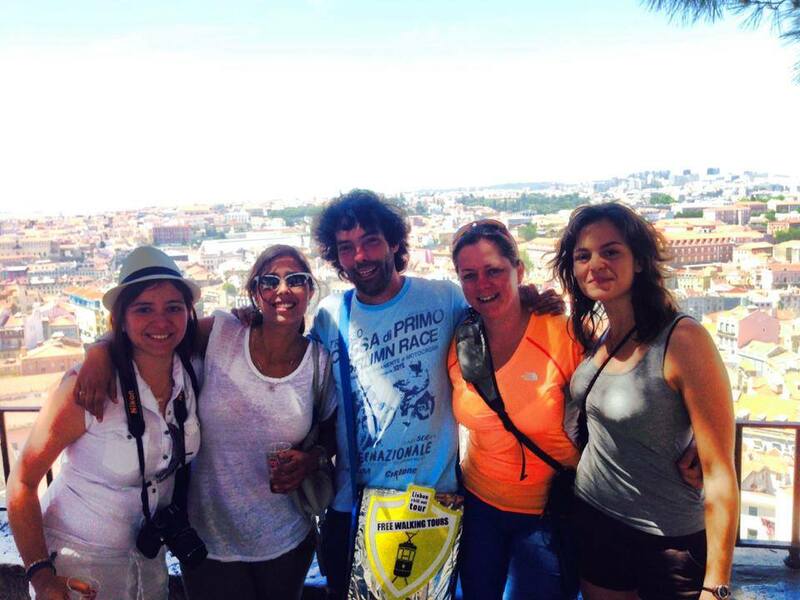 So, how much should you tip free tour guides in Lisbon? It really depends on how you valued the tour and the guide, as well as how much you can afford. The cost of a paid tour in Lisbon can be anywhere from €18 to €40 per person at the lower to mid-range, and as high as €75 to €100+ per person depending on the type of tour, theme, and content. From our research with local Lisbon free tour guides, we’ve learned that the average tip is usually anywhere between €9 and €15 per person. That should have your free walking tour needs in Lisbon well and truly sorted. All of these free tours meeting points are easily found on a Lisbon map and easy to get to, we recommend grabbing a free metro map as well as your Lisbon city guide. Check out the best pub crawls in the city if you fancy exploring Lisbon’s lively night life with a ready-made gang of fellow party-people. Lisbon awaits you, have fun!